The French Riviera, spring 1936: It’s off-season in the lovely seaside village of Juan-les-Pins, where seventeen-year-old Ondine cooks with her mother in the kitchen of their family-owned Café Paradis. A mysterious new patron who’s slipped out of Paris and is traveling under a different name has made an unusual request—to have his lunch served to him at the nearby villa he’s secretly rented, where he wishes to remain incognito. Pablo Picasso is at a momentous crossroads in his personal and professional life—and for him, art and women are always entwined. The spirited Ondine, chafing under her family’s authority and nursing a broken heart, is just beginning to discover her own talents and appetites. Her encounter with Picasso will continue to affect her life for many decades onward, as the great artist and the talented young chef each pursue their own passions and destiny. New York, present day: Céline, a Hollywood makeup artist who’s come home for the holidays, learns from her mother, Julie, that Grandmother Ondine once cooked for Picasso. Prompted by her mother’s enigmatic stories and the hint of more family secrets yet to be uncovered, Céline carries out Julie’s wishes and embarks on a voyage to the very town where Ondine and Picasso first met. In the lush, heady atmosphere of the Côte d’Azur, and with the help of several eccentric fellow guests attending a rigorous cooking class at her hotel, Céline discovers truths about art, culture, cuisine, and love that enable her to embrace her own future. 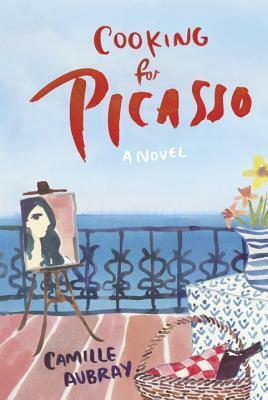 Featuring an array of both fictional characters and the French Riviera’s most famous historical residents, set against the breathtaking scenery of the South of France, Cooking for Picasso is a touching, delectable, and wise story, illuminating the powers of trust, money, art, and creativity in the choices that men and women make as they seek a path toward love, success, and joie de vivre. I won a copy of this book through the Goodreads First Reads program in the hopes that I would leave an honest review. I managed to talk my book club into reading this book for one of our meetings...and then I was the only one who had even come close to finishing it in time (and even I was only about halfway through it when we had our meeting). This book made me happy, sad, and angry all at different times. It was a veritable roller coaster of emotions. I wanted everything to work out for everyone, and that just wasn't in the cards. While I didn't get exactly what I wanted for all of the characters, the journey to the end of the story was intriguing and ultimately delightful. My favorite character in this story was Ondine. Even though she'd started out as a naive girl, the circumstances she finds herself in toughen her up into a formidable woman. However, I also felt the most sorry for her for the way things panned out in the end. She had worked so hard for everything she had that it's a shame the way things went down. I felt like a certain prominent British chef had a bit of a cameo role in this story, or at least a character was probably somewhat inspired by him, and that sort of made me giddy at times. Camille Aubray is the author of COOKING FOR PICASSO, a novel which PEOPLE magazine selected for "People's Picks: The Best New Books" with this praise: "What would you do if you learned your grandmother had once whipped up meals for Pablo Picasso—and received a painting, now lost, in return? Head to the Côte d’Azur to track it down and fall in love with a chef, of course. Makeup artist Céline does just that in Aubray’s delicious, atmospheric novel. You’ll be glad you’re along for the ride."